Brackenridge use to be a state park but now it is under personal management. They were very friendly and helpful. We camped in one of the circle sites (which back in) on the lake. Ours was number 27 and it was a nice site. Although 29 would look right out on the lake from your door. They are full service with sewer. There are trees on these circle sites. The sites face the lake, which is on the east which is nice for the trees would help in the summer. We went in February and it was just fine. They also have pull throughs but they have no trees to protect them from the Texas heat. Brackenridge is a big park expanding to the other side of the highway. We did not get a chance to explore the other side. They have a convention type center for horse events and also a few cabins for those who do not have campers. From where we were it was just a short walk to the office but to go to the marina or other places it requires road travel. To get into the camping site you must be registered and have a password to get through the gate. We went hiking on the trails there - they are not too long, easy and they pass the old church and the spot where the Brackenridge family had their plantation home. Those who enjoy the history of Texas would be interested in it. We did. It was great. Since we were there in February, it was not crowded but I could imagine the crowds during the summer with the lake activities. It is a nice park and we will be returning. 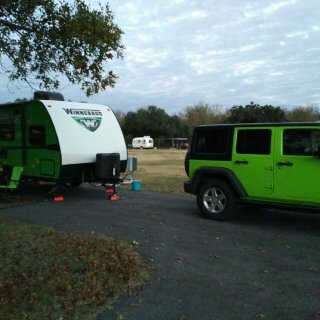 We camped at Brackenridge Park & Campground in a Travel Trailer. If you need supplies, they have a Tractor Supply in Edna as well as a HEB for food. Wal Mart is in Victoria or probably El Campo. There is a seafood place on the outskirts of Edna that has great gumbo. Also downtown Edna is nice. They have a neat old movie theater there that I photographed. It is a nice little park and has easy trails. We took our elderly collie and Samoyed with us and walked the dam walk. They enjoyed that. 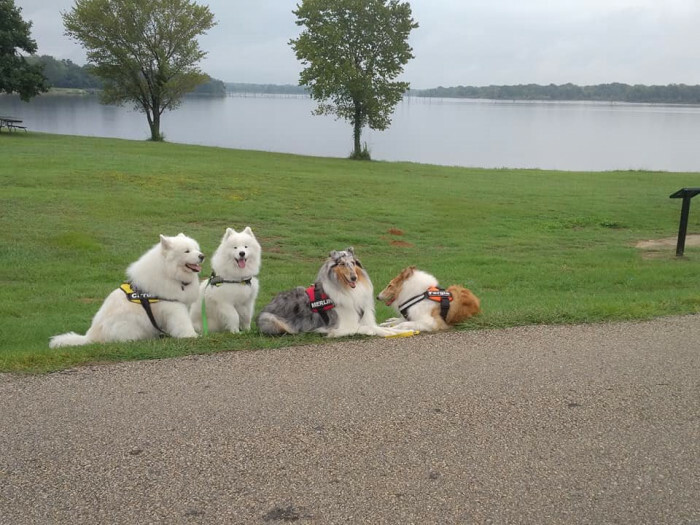 We then took our other collie and Samoyed on the other trails. It is quiet, there is privacy and we will be visiting again. We did go to Athens for a couple items. It was not a long trip. If you need to shop for any items, Athens is not that far away. 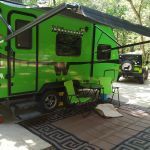 We camped at Purtis Creek State Park in a Travel Trailer. We tried to get into Atlanta State Park but it was booked for that weekend. We decided to try Rocky Point. It is a nice park right on Wright Patman. We parked at C12 right on the lake. It being November we had some high winds all that weekend. We did hike there but it was overshadowed for my husband became sick - food poison before we arrived. He did not realize it until we were there and set up. He is a trooper and as I said did hike and went to Atlanta State Park and hiked a little there too. It is a nice park and I do recommend it. 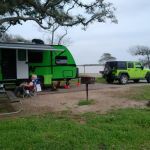 We camped at Rocky Point COE in a Travel Trailer. It is the Wright Patman Dam Campground. There is hiking to do or you can go into Texarkana for food and entertainment. Fishing is also allowed as well as boating. When we were there, it was November and the winds were bad so not much of that we could do. This is a nice little state park. All the RV/trailer sites are pull through and have full hookups. We love the hiking trails. They are not difficult, which is a relief since we have two elderly dogs and we, ourselves, are getting older. 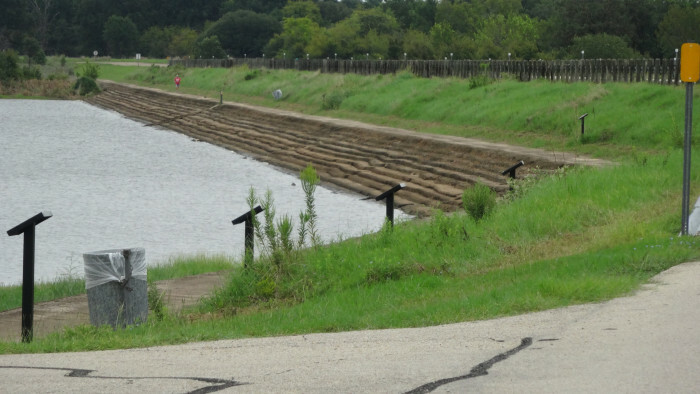 The one trail that goes along the Brazos River is off limits due to flooding but the rest is just fine. It is quiet, it has plenty of shade and for those who love to golf, there is a private golf course right next to it (not part of the park). If you just want a small, quiet area and plenty of walking, this is it! 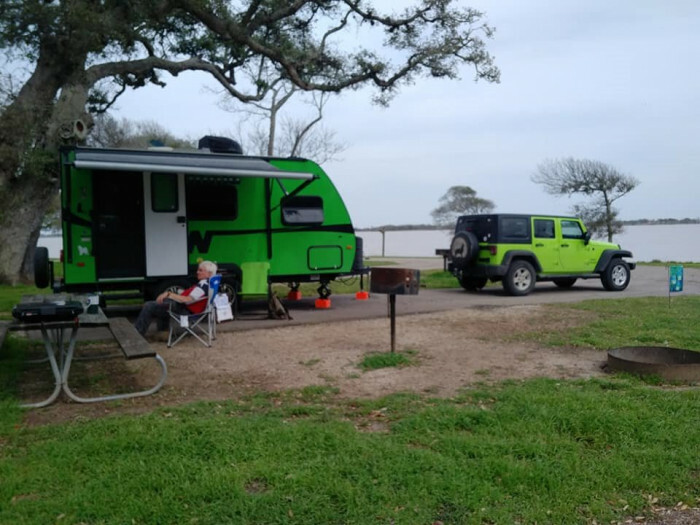 We camped at Stephen F. Austin State Park in a Travel Trailer. This is a jewel of a park. The "big sister", Bastrop SP, is just NE of Buescher and easy to go to with the park road but it was packed. Buescher is nice and quiet and a lovely park. If you want a quiet place, this is it. The rangers are great. The sites are small, however. No problem with our 18 foot. There are a few longer but bigger rigs could get into the smaller ones. They just need to be careful and know how to back in. They have overflow parking to park your vehicle if there is not enough room. There are no pull through sites so be aware if you have trouble backing up your rig. Lots of trees but that is what makes it so nice. The lake is nice and next time we will fish. They have nice trails and we want to go back when it is cooler so we and the dogs can navigate them easier. 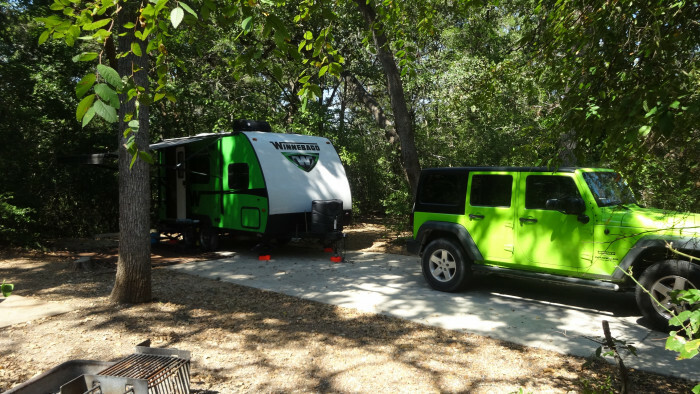 We camped at Buescher State Park in a Travel Trailer. There is South Market in Smithville for barbecue. Both Smithville and Bastrop are nice to visit. 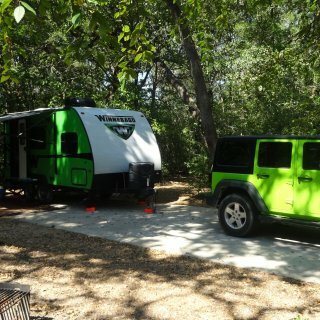 We chose Buescher for it was more secluded then Bastrop SP and quieter. It has a nice little lake to fish or have a small boat. Canoes are available to rent. Nice hiking trails. We stayed at Oak Haven for it was more shady. Cozy Circle is just that - the rigs are close together. The first four in Cozy are longer for the big rigs. Not as much shade. This is a very nice State Park. Our site was in the Post Oak section and it was newly paved and a very nice area. The sites were not bunched up and you have a little privacy. We went with friends and had a nice time. We hiked the trails and my husband and one of the friends went fishing. It is a nice, clean lake. They have boat ramps or you can fish off the pier on even just anywhere on the lake. The park Rangers were nice and helpful. It was a very pleasant experience. We have been there twice before and will go back again. 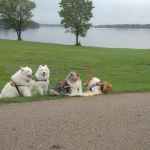 We camped at Fairfield Lake State Park in a Travel Trailer. It is a large park so having a vehicle to travel in is suggested especially if you wish to fish off the pier. It is on the other side of the lake. There is, however, another site within walking distance to fish. We have a trailer so no problem there. We have stayed at Mother Neff twice now. The first time was July 2016. The second time April 2018. This is not the fault of the park but the first time it was hot as Hades and the second time a cold front came in and we had to go to town to find warm clothing! Yes, we hope the third time is the charm. But it is still a wonderful park. The sites are very nice, concrete and full hookups. It is a small park so it is nice and quiet. We love the trails especially the trail to the tower. The rangers are top notch and quite helpful. Mother Neff was the first Texas State Park. It is not that far from Waco which has some nice sights. 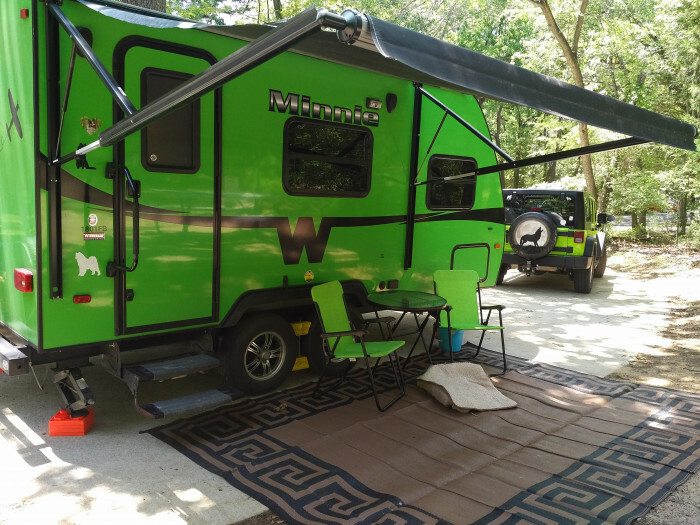 We camped at Mother Neff State Park in a Travel Trailer. Not far from Waco or Temple if you need additional items. We just went to hike and chill out. It gave us a chance to relax and create! We have been here three times in our Mini Winnie travel trailer. November 2015 in number 201, February 2017 in number 202 and then March 2018 in number 312. They were are nice spots. 312 was especially nice since it was a pull-through. We have always had a nice experience at Martin Dies. We lived in the area (Spurger) and I have friends in Jasper so we also visit them. The rangers have always been very nice and it is a wonderful place to just sit back and chill. We camped at Martin Dies JR. State Park in a Travel Trailer. If you like to go out to eat, there is the Cedar Tree in Jasper. It is a buffet and very good. We had plans to stay at Millwood in May 2015 on our way back from Petit Jean, but due to the flooding that year it was impossible. The staff made sure to call us in advance to let us know. That was very nice for we were able to make arrangements at Daisy SP (the one we stayed at on the way up). So in October 2017 we went to Petit Jean and was able to stay at Millwood. It is a nice little park right on the lake near the dam. It would be wonderful for people who like to fish or just relax. It was quiet that night we stayed. The rangers were very nice and helpful. Maybe one day we will stay for a couple days and get to enjoy it even more. We camped at Millwood State Park in a Travel Trailer. We have stayed three times at Daisy. We stopped there on the way to Petit Jean. First was coming and going in May 2015 then again in October 2017 we stayed there on the way back (we stayed at another park on the way up). All three times we enjoyed the little park. The rangers are really nice and helpful, the sites are nice, the hiking trails fine and the lake, Greeson, is beautiful. People who fish will love this park! We camped at Daisy State Park in a Travel Trailer. Fishing is the main thing. Greeson Lake is beautiful and I have heard the fishing is good. It is out and away from any major towns so it is nice and quiet. We stayed there three time. We were in #94, which was a back in, 94 and 98 were both pull throughs. The place is nice and clean and we will be going again! Fort Parker is not a big state park. There are less then 30 spots for overnight stay. 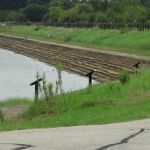 It is on the Navasota River and Fort Parker Lake. It is quiet and the hiking trails are easy. You can enjoy a picnic lunch and fish. We love the serenity of the place. There is Mexia and Groesbeck close by if you run out of supplies. This is one of our favorite places. We camped at Fort Parker State Park in a Travel Trailer. We go there mostly to hike and just chill. There are shops in Grosbeck for those who like to antique. There is a Fort Parker historical site where they have recreated the old Fort. It is separate from the State Park. 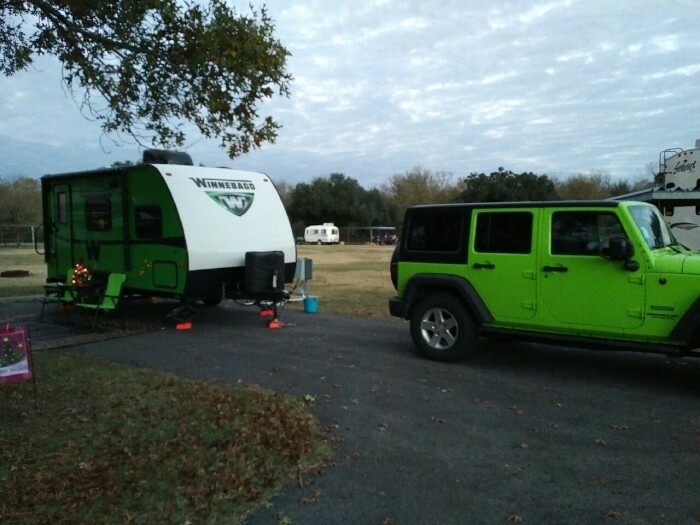 We went to Lockhart the first year we bought our Winnebago Mini in 2014. We went in December. We have been going there every year. Yes, we do golf (me not so much) but the golf course there is a nice nine hole one. We stayed along the creek the first year (site 11) and it took a little to get the trailer level, but we make sure to get one in the circle (#3) the following year. It is nice, quiet, we do walk the little trails. The main event is checking out Lockhart. Their courthouse is a sight to see. They have nice shops around it and, of course, the barbecue is the main event. We have tried Smitty's, Chisholm's, Kreuz's and Black's. We find Black's is the best with Chisholm's right behind it! We plan on making the trek again this December! We camped at Lockhart State Park in a Travel Trailer. Hiking up to the center so you can overlook the area. Shopping in Lockhart as well as eat great barbecue. Nice, quiet and very comfortable. The rangers are top notch too. We have been going up to Arkansas every spring and fall for the past 20 years. We usually stay in Russellville and drive to Petit Jean (which is not all that far away) to hike the wonderful trails. We especially like the Seven Hollows trail, however, we only get as far as the Grotto now. Crawling up the rocks to the turtle rocks has become difficult. Cedar Falls is also nice but it can be hard going up and down the 1/4 mile to get down there. Also, people should have excellent hiking shoes. I have seen people in flip flops! Not a good thing. We did buy a travel trailer in 2014 and in 2015 we took it to Petit Jean to meet friends that came down from Chicago in their RV. It was a nice stay but it was on Memorial weekend. We decided we wanted to come up to Petit Jean in 2017 and found if we reserved right away we could get a spot on the lake. There is a lot to do if you are a hiker, walker or just want to relax at the lake. We camped at Petit Jean State Park in a Travel Trailer. If you are a hiker, this park is for you. Seven Hollows is 4.5 miles and a wonderful trail. We have been coming here for 20 years + now and we only get as far as the Grotto for we can not navigate the rock climb to the turtle rocks. But even going as far as the Grotto is nice. Cedar Falls too although it can be strenuous. It is best to have good hiking shoes for this.